Barlow High School is presenting a free performance of a moving play that explores school violence and bullying, based on the shooting at Oregon's Thurston High School in 1998. "It is one of those pieces that takes a lot out of you, for both the actors and the audience," said Jeff Schroeder, theater director at Barlow. The one-act play, "Bang Bang You're Dead," will be followed by discussions about school safety and mental health. 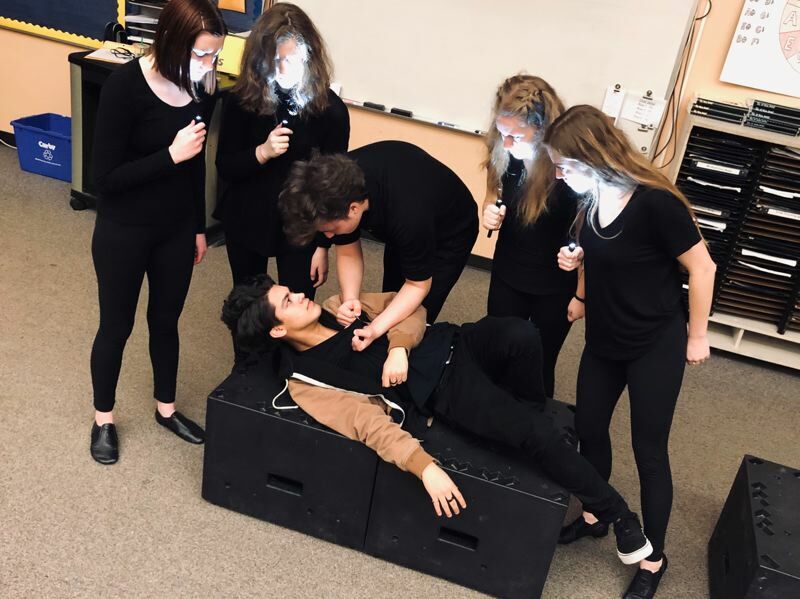 "Following the performance, audience members can participate in breakout sessions and talkbacks with the student actors, administration, law enforcement and our school social worker," Schroeder said. The free performance is at 6:30 p.m. Thursday, Feb. 21, in the Barlow High School Cafeteria, 5105 S.E. 302d Ave.
"While the play deals with the subject of school violence, there is no strong language in the play and no guns or weapons appear on stage at anytime," Schroeder said. Schroeder was introduced to the play when he was a senior in high school and it was first performed by Thurston High School students at a state thespian festival. The author William Mastrosimone worked with the theater teacher at Thurston High School to write Bang Bang. It was controversial when it debuted in a Springfield, Ore., theatre in April 1999, less than a year after the Thurston High School shootings. However, it was considered a success. On May 21, 1998, Kip Kinkel, an expelled student at Thurston High, murdered his parents and then went to the school and shot 27 people, killing two students. Bang Bang was written before the tragic 1999 shooting at Columbine High School in Littleton, Colo., and predated the Sandy Hook Elementary School shooting in 2012 in Newtown, Conn. It also debuted way before the shooting at Reynolds High School in June 2014. After its debut, Bang Bang was offered free to schools and groups and was the most-produced one-act play in high schools during the 1999-2000 school year. The simple set and contemporary high school student costumes makes it technically easy to produce. In 2016, Barlow actors performed Bang Bang and received honors at the Oregon State and International Thespian Festivals. "The kids had no idea the impact this play would have. There was not a dry eye in the room. It was one of the most powerful theater experiences I've ever had," Schroeder said. "After the shootings happened in Florida (Parkland on February 14, 2018), I decided I had to do this play again." This 2019 performance includes all the students in Schroeder's advanced theater class. Junior Derron Madrano plays Josh, the shooter. Other cast members are junior Bryce Coverdale, senior Avery White, senior Lexi Cheney, senior Sherry Mindiola, senior Savannah Serviss, senior Emily Schneider, senior Christian Maxey, senior Katherine Hardenbergh and senior Shyloh Peckham. At one point, the students killed by the character Josh tell him what they will miss about being alive. To make the play more impactful, Schroeder altered the script slightly and has the actors recite what they themselves would miss about their lives. In addition, he has each student research one of the dozens of school shootings in the U.S. and learn about the victims. The 23 students from the class will come on stage wearing T-shirts that list the name of a school where a shooting took place. Sadly, he says, "the play is even more relevant than when we did it in 2016."